Yes we just concluded the Short Course in Jacket-Making and Trousers and it went great! There's Ruth checking the fit of her jacket before inserting the sleeves. I think it looks great! :-D I totally enjoyed running the Course and though it took a bit longer than the 4 weeks originally planned, we completed it and I now know exactly how long it will take to complete the Course. Yes yes! That is the new Martwayne logo. :-D :-D :-D We decided on a fresh new outlook for our company and what better time to launch it than in a new year with a new burst of energy! And of course with the new year came new ideas which birthed new courses. We've been doing quite a bit of work backstage so hopefully, you should see some of them soon. In the past we have had people asking us to open up our popular Foundation Course in Fashion Design to a wider group of designers who can start halfway through the Course. And we listened! So if you can sew, you can now register for later stages of the Foundation Course to improve on your skills without having to start from scratch! And the best way to do that was to break down the Foundation Course into a series of Short Courses which you can register for. The Short Course in Jacket-Making and Trousers was our test run and it worked. This was originally Level 3a of the Foundation Course. So what does this mean? Beginners who want to specialise in say jackets for example can, after completing the Short Fashion Course for Beginners, skip Levels 2a and 2b (which will now be the Short Course in Bodices and Dresses) and move straight to Level 3a - now the Short Course in Jacket-Making and Trousers. Similarly, if you can already sew and want to improve your skills further, you can opt for the Short Course in Bodices and Dresses straight up without attending the Short Fashion Course for Beginners. So that way, everyone can benefit from the Course and can plan their time and finances better. And if you want to know everything, you can simply register for each of them when we run them - and this means you would have completed our Foundation Course in Fashion Design. So here is a brief overview of each of the new Courses. Details of the fees and duration will be provided when we have specific start dates for the Courses. As always they will be run as part-time courses and some will have a weekday and weekend option. Due to the elections, our Courses will begin after the 14th of February, 2015. This Course, as the name suggests, is targeted at those who cannot sew and want to start from scratch. It was previously Level 1a of the Course and is pretty much an introduction to fashion design and sewing. We will, of course, discuss some business aspects of fashion as well so new entrants into the industry have a good idea of the opportunities available in the Industry and what you pretty much need to start a fashion business. The fees for this Course will be N45,000 and there is an additional one-off payment of N7,500 for the toolkit. There are 2 options for this Course; the weekday option will last for 5 weeks (twice a week) while the weekend option will be double the time since classes are on Saturdays only. 2. Short Course in Bodices, Shirts & Dresses (previously Levels 2a and 2b of the Foundation Course). This Course is only open to anyone who can already sew. This, of course, includes beginners who have completed the Basic Fashion Course for Beginners. Please note that if you cannot sew, you would need to complete the Basic Fashion Course for Beginners first before registering for this one. Similar to the version of the Foundation Course, the Course is in 2 Modules, a Basic Level (Module 1) and an Advanced Level (Module 2). Each Module is a separate course meaning participants will register for each one separately (similar to how it was previously run). Please note that you can only register for Module 2 only after completing Module 1. The weekday option for Module 1 will last for 6 weeks (twice a week) whilst the weekend option will be double the time. The fees for Module 1 are N45,000 and there is an additional payment of N7,500 for the toolkit. [Those who have registered for the Basic Fashion Course for Beginners do not require a toolkit anymore since they already have one]. Module 2 will last double the time for both options (i.e. 12 weeks for the weekday option & 24 weeks for the weekend option). Yes there is a lot to learn in Module 2! The fees are N75,000. This was what we just concluded and will pretty much take the format of what we just concluded. 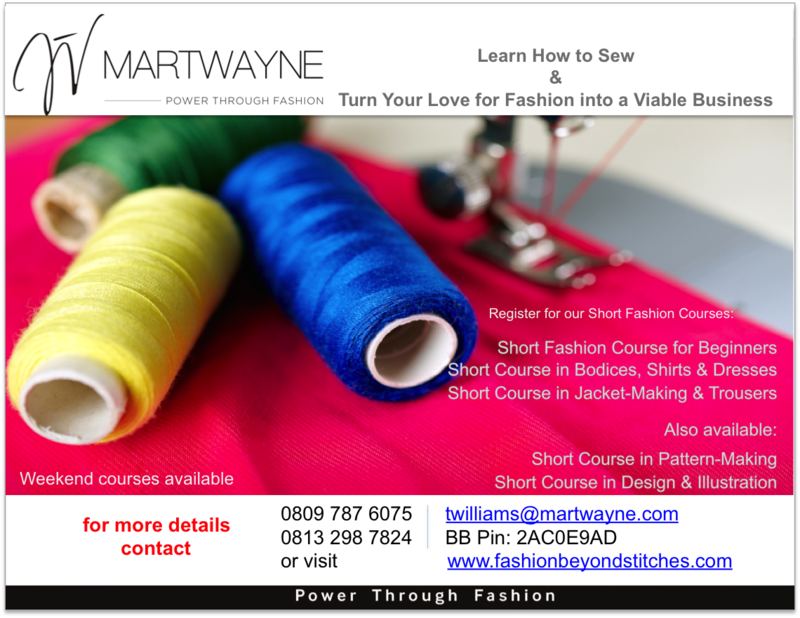 This is also open to those who can sew - including those who have completed the Basic Fashion Course for Beginners. As stated earlier, students who have completed the Beginners Course can skip the Short Course in Bodices and Dresses and register for this. If you want to learn how to make dressmakers jackets though, you would need to register for Module 1 of the Short Course in Bodices and Dresses to understand the block. The Course will last for 6 weeks (weekday option, twice a week) while the weekend option will also be double the time. The fees for the Course are N45,000 and there is an additional one-off fee of N7,500 for the toolkit. This is an entirely new Course and combines elements of our Level 1b with Volume 2 (how to develop your designs from scratch and how to draw) and Volume 3 (Understanding Colours and Fabrics) of our Fashion Entrepreneurship Course. The main objective of this Course is to teach designers how to develop a collection from scratch and how to draw the various elements of their storyboards, particularly the fashion figure and how to build a portfolio. This is especially vital when entering competitions and also when dealing with customers. We just completed part of this Course for some students already registered on the Foundation Course and it received rave reviews. It is open to both students who cannot draw at all, beginners in the fashion industry as well as experienced designers and illustrators. At the moment, only the weekday option is available (twice a week) and it will last for 6 weeks. The fees for the Course are N55,000 (inclusive of the kit and textbook). We are still exploring how to make the weekend option available and when this has been finalised, we will let you know. Great! :-D That's it for the new Courses. Of course our Short Course in Pattern-Making and our Fashion Entrepreneurship Course still exist. And so does our Basic Fashion Course for Juniors. As stated earlier, we will give details of these Courses when we are about to launch them. If you, however, are interested in starting any of our Courses before the official launch dates, do let us know so we can come up with a plan for you! We do have other Courses in the works and when we have finalised on those, we will let you know. Our official website is work-in-progress and it will be live when we are done! Do look out for it. Thank you all for your support so far and have a great week!